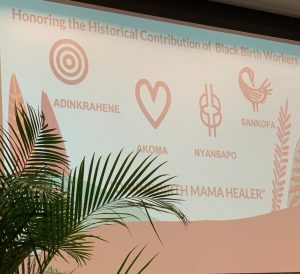 I was excited to attend the Black Maternal Health Conference & Training Institute on December 6-9, 2018 in Atlanta, GA. Black Mamas Matter Alliance (BMMA) sponsored this conference. And what a dynamic alliance. The conference purpose was to advance Black maternal health, rights and justice. It was important to me that Black women’s voices were the experts on maternal mortality. And that our coming together would create a think tank for solutions. I was invited to participate in the opening plenary as a presenter and to facilitate a Sunday morning workshop. I attended happily to learn and to contribute. 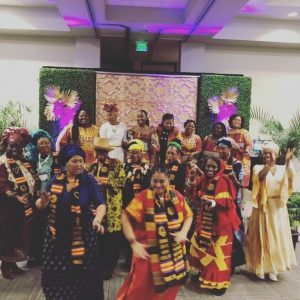 The conference was attended by Black Women-led Organizations operating at the national, state and local levels. Their activities are guided by the birth justice and human rights framework. The conference attracted midwives, doulas, physicians, lactation consultants, nonprofits representatives, birth workers, writers, policy and researchers, public health officials, nurses, midwife students, students, mothers, fathers, partners, stakeholders, funders, and interested persons. We came together to stand in solidarity for reproductive and birth justice. Our intent, to end the disproportionate rate of maternal mortality and morbidity for Black women, thus benefiting all women from preventable deaths from childbirth. The Friday soiree was amazing. Everyone was dressed in their best. Brilliant colors and African patterns filled the room. The soiree open with the Mayat Gayian all female African dance, drum and vocal ensemble. They drummed in the elder birth workers who would be honored later that evening. Once seated Monica Raye Simpson, Executive Director of Sister Song open the evening with libation. We called out the names of our ancestors to welcome them into the room and to the conference. Included in the soiree was honoring ten elder midwives/birth workers for their outstanding achievements in improving infant and maternal mortality. The honorees were called to the stage one by one to receive a stole with Adinkra symbols on it. The Adinkra symbols on the stole represent, leadership, love, strength, and learn from the past. The inscription on the stole says,” Divine Birth Mama Healer.” The stole would distinguish the elder birth workers throughout the conference and for life. 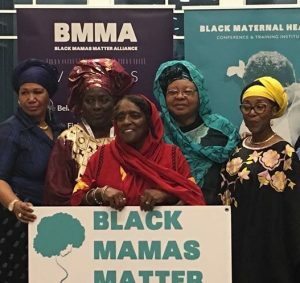 This ceremony knitted a generation of Black midwives, who collectively have served thousands of mothers, babies and their families. It was both an emotional and historical moment. The evening ended in community, dancing, laughing and meeting new friends and reconnecting with old friends. The soiree was the perfect medicine to uplift us, as we tackle the painful topic of mothers dying from childbirth, over the next day and half. Those honored were: Nyasha Bonner, Claudia Booker, Marsha Ford, Sarahn Henderson, Dr. Fleda Jackson, Jennie Joseph, Shafia Monroe, Nasrah Smith, Nonkululeko Tyemba, and Ummsalaamah Sondra Abdulla-Zaimah. The honorees mentioned but not present were: Afua Hassan, Maria Milton, Byllye Avery, Maria Milton, Shelia Simms Watson, and Selena Green. The plenaries were informative, motivating and action orientated. I wish that I could have attended all of them. On Saturday I attended “Battling Over Birth: Black Women and the Maternal Health Care Crisis. The presenters were: Chinyere Oparah, PhD and Sayida Peprah, PsyD. This workshop discussed how to design research that reflects the voices of those most impacted and how to decolonize maternal health. On Sunday I had great joy in presenting my workshop: Creating Birth Plans for Black Women’s Empowerment. This workshop involved the participants on how to use of a birth plan to empower Black women to be aware of maternal mortality, by expanding its purpose and terminology. Maternal mortality is a national problem. It will take all of us to end preventable deaths from child bearing. My mantra is “Midwives are the first line of defense …. 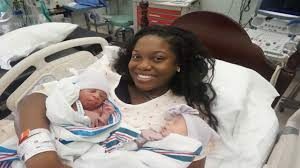 make it a household word.” Let Black pregnant women and new mothers know that you are there for them. Reassure them that they can celebrate having a baby and have a positive birth and postpartum experience. Download the Maternal Health tool kit at www.blackmamasmatter.org for more information. Get involved. Hi Dr.Farrington, thank you for your comment. It was great to meet you at the conference. And I enjoyed your participation in my workshop. I look forward to the 2020 Black Maternal Health Conference & Training Institute, and I hope to see you there. I will be sharing my new “Mama Shafia Full Circle Maternity Care Plan,” soon. Stay tuned. Train as a SMC Full Circle Doula Birth Companion! Join INDOULAS19 Group Registration! There are 15 spaces available in this group. Group registrants receive 15% off Training tuition. Register by February 28, 2019. Read full details on SMC's Facebook Event Page. This training designed to honor the legacy of the 20th Century African American midwife, the history of the doula, physiological birth, the midwifery model of care, breastfeeding support and honoring the father. Read More.